NEW YORK (AP) — Irishman Conor McGregor made his Madison Square Garden debut Tuesday night with expected bravado. The Irish "built this city. Now I'm coming to claim what's ours," McGregor told a news conference at the Theatre at Madison Square Garden, where UFC announced its UFC 205 event. The wildly popular brawler is fighting in the main event for Eddie Alvarez's lightweight belt — one of three title fights on a card with several matches that could easily headline a different event. The UFC wants its Madison Square Garden event on Nov. 12 to top the promotion's biggest cards, especially after UFC 200 in July was marred by doping violations and a lineup that reshuffled several times. "It's an honor to be here," McGregor said. "I cannot wait to perform. ... The Irish love New York and I'm honored to be here." "It took longer that it should've," UFC President Dana White said. The stacked card also includes new welterweight champion Tyron Woodley's first title defense against Stephen "Wonderboy" Thompson, along with straw weight champion Joanna Jedrzejczyk's defense against fellow Pole Karolina Kowalkiewicz. Popular veteran fighters Donald "Cowboy" Cerrone, Miesha Tate, Frankie Edgar, Chris Weidman and Rashad Evans also are in the show. McGregor was joined at the news conference by Thompson, Jedrzejczyk, Kowalkiewicz, Cerrone, Edgar, Weidman and Alvarez. "This is a dream come true," said Weidman, who is scheduled to fight Yoel Romero. Weidman lives and trains on Long Island. "I've been envisioning this for so long and we're here right now. We got this fight in about six weeks and I can't wait to come down here and fight in front of all you guys." For the card's depth, McGregor is its main selling point. And he knows it. "$4.2 billion," McGregor said. "$4.2 billion. That's what I'm worth to this company." McGregor (20-3) has become the UFC's biggest active star in the past two years with a series of gritty fights and a loquacious promotional style. 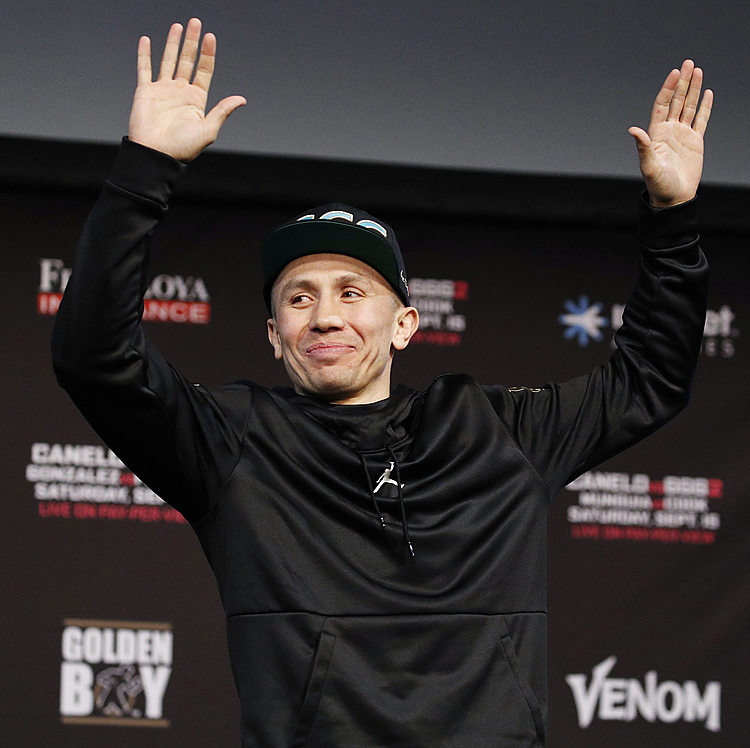 Although he won the UFC's featherweight title in December with a 13-second knockout of Jose Aldo, his last two fights were lucrative welterweight bouts against Nate Diaz, with McGregor avenging his loss to Diaz in August. He was originally scheduled to headline UFC 200 in Las Vegas against Diaz, but the bout was bumped when McGregor bickered with the UFC over money and promotional obligations. "That fight was five weeks ago," McGregor said. "I came out of that fight fresher than (when) I went in. Look at Nate's face. Nate will never look the same. I came out brand new. I had a bruised foot." McGregor gets to keep his 145-pound title when he takes on Alvarez (28-4), who won the 155-pound belt in July with a first-round stoppage of Rafael Dos Anjos. McGregor still hasn't defended the featherweight belt. White said UFC "would figure that out when it happens," when asked whether the promotion would allow McGregor to hold the 145-pound and 155-pound titles at the same time. "I'm going to wrap one on one shoulder and wrap the other one on the other shoulder," McGregor said. "It'll take an army to come take those belts off me." Aldo beat Edgar in July to win an interim featherweight title, and the Brazilian is unlikely to be happy about the UFC's latest decision. 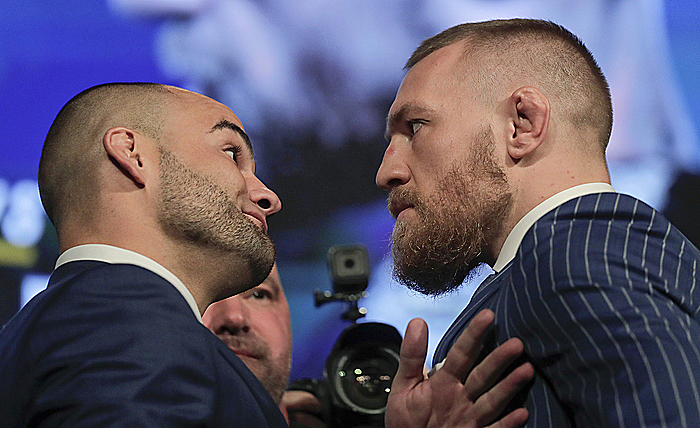 White had previously indicated that McGregor would need to defend his belt against Aldo soon. Unbeaten lightweight Khabib Nurmagomedov is also unhappy about McGregor taking his place in line to fight Alvarez. The tough Russian fighter tweeted at Alvarez and McGregor that "your time will come to get my hands on you." During the press conference, White announced Nurmagomedov will fight Michael Johnson on the card. UFC 205 is a chance for the promotion to showcase a megacard in a way it failed to do earlier this year in Las Vegas when McGregor was pulled from UFC 200. The replacement main event was also canceled when Jon Jones was notified of a potential doping violation the week of the fight, disqualifying him from his bout with Daniel Cormier. After UFC 200, U.S. anti-doping officials also found Brock Lesnar, the former WWE star, had violated the UFC's drug policy at the event. "When we finally got New York done and we were coming into Madison Square Garden, I wanted to bring the best card possible," White said. "This is the biggest card we've ever done. "This is the best all-around fight card in UFC history."